Sooner or later a man who wears two faces forgets which one is real. In Chicago, an Archbishop has been brutally murdered, and a sweet-faced altar boy named Aaron - who was seen fleeing the scene of the crime and whose clothes were soaked in blood - is charged with the crime. Aaron claims he was present when the murder occurred, but that he is not the killer. Coming to Aaron's rescue in this high-profile case is Martin Vail, a cocky lawyer who loves the media's spotlight as much as he loves his job. The legal road ahead of Martin and Aaron is filled with many obstacles, including a very determined prosecuting attorney (who's Martin's ex-lover), revelations about the Archbishop's "relationship" with the altar boys, and Aaron himself, who has a very violent, repugnant second personality named Roy. Is Aaron/Roy guilty? Or is he taking the fall for someone else? $9.900 million on -unknown- screens. Every once in a while, an actor makes a huge impression in his very first movie role. At the age of 26, Edward Norton accomplished that with his debut in 1996’s Primal Fear. Norton literally came out of nowhere and turned heads with his work in the flick. It earned him an Oscar nomination and launched him on his career. I like Norton a lot, but I’m not sure he’s ever quite lived up to the promise he showed in Fear. The film introduces us to cocky, generally amoral defense attorney Martin Vail (Richard Gere). When a 19-year-old altar boy named Aaron Stampler (Norton) allegedly murders Archbishop Richard Rushman (Stanley Anderson), Vail decides to take the defendant’s case. Does he do so out of a desire for justice? No – Vail simply sees this as a high-profile way to promote himself. Matters complicate when Vail runs the actual defense. Though Stampler admits he was in the room at the time, he claims someone else killed Rushman and states he blacked out during the killing. This sets a complicated defense into place as Vail attempts to keep Stampler from the gas chamber – and encounters plenty of twists along the way. 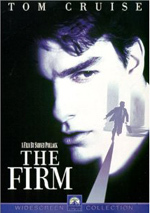 In the wake of John Grisham’s success, the 1990s featured plenty of legal dramas very similar to Fear. Does this one differentiate itself from the rest? Not really, though the film certainly boasts an excellent cast. That’s not unique, as those Grisham adaptations came with large rosters of stars. At the time, Fear couldn’t claim a lot of big names, but in retrospect, it looks very good. In 1996, Gere was literally its only “name”, but that changed. In addition to Norton, the film features Laura Linney, John Mahoney, Andre Braugher, Maura Tierney, Alfre Woodard and Frances McDormand, who would win an Oscar for the same year’s Fargo. That’s a decidedly distinguished group of actors, and they bring more substance to Fear than the legal melodrama probably deserves. Norton remains the movie’s calling card. In fact, without his Oscar-nominated performance, I doubt Fear would maintain much status in the public consciousness. Back when I saw Fear in 1996, I felt dazzled by Norton’s work. As I mentioned, he came out nowhere for this flick; it was his first movie role, and he turned in an impressive turn. 13 years later, Norton’s performance doesn’t look quite as stunning, largely because it lacks the surprise factor. In 1996, I went into Fear with no expectations and no clue who Edward Norton was. In 2009, I watch Fear with full awareness of his talents, so I see it in a different way. Not that this diminishes Norton’s solid performance. We can still see why he made such a positive impression, as he ably handles all the role’s demands. Aaron is a complicated part, and Norton delivers the goods. It stands as a testament to the quality of Norton’s work that I remembered his performance so well after nearly 13 years. I’ve probably watched upwards of 3500 movies since Fear hit the screens, and I barely recall most of them. I was surprised to realize how well I remembered the elements of Norton’s performance; he really stood out and stayed in my mind. The other actors seem perfectly fine, though none of them make a similarly strong impression. Gere never breaks a sweat here, as this is the same sort of part he’s done a million times. By 1996, Gere had the arrogant slickster down pat; he’s perfectly fine here, but he doesn’t do anything particularly memorable. The same goes for the movie itself. As I mentioned, similar films were a dime a dozen in the 1990s, and they all essentially blend into one. In terms of story, characters and the like, Fear does nothing to break the mold. It offers enough twists and turns to keep us intrigued, but it never seems especially clever or original. The generic nature of the title seeps into the rest of the production. It’s a more than competent piece of work, but it fails to stand out from the crowd. Don’t take that to mean that Primal Fear fails to entertain. Sure, it paints by numbers much of the time and lucks into a strong performance from a then unknown, but it keeps us occupied for its 130 minutes. Given how many really bad legal dramas came out in this one’s era, that turns into some kind of accomplishment. 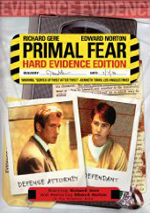 Primal Fear appears in an aspect ratio of approximately 1.85:1 on this single-sided, double-layered DVD; the image has been enhanced for 16X9 televisions. This was a pretty average transfer. Sharpness seemed acceptable for the most part. Some shots suffered from mild softness, but those never became overwhelming. The majority of the flick offered good delineation, though it rarely seemed particularly concise. No issues with jagged edges or shimmering appeared, and only light edge enhancement could be seen. Except for a couple of speckles, print flaws remained absent, but grain tended to be a bit heavy, especially in interiors. Colors seemed ordinary. A few interiors with red lighting tended to be somewhat runny, but otherwise the hues offered adequate clarity. They didn’t excel but they seemed okay. Blacks were fairly dark and deep, while shadows displayed nice definition. While I thought this wasn’t a transfer with notable problems, it failed to become much better than mediocre. I felt the Dolby Digital 5.1 soundtrack of Primal Fear worked pretty well. Without an action orientation, the mix didn’t boast a lot of showy sequences, but it contributed a nice sense of environment. The early scenes that followed Rushman’s murder offered the most information, as they included various vehicles that swarmed the spectrum. Otherwise, the track provided good stereo music and a clear feeling for the settings. Across the board, audio quality satisfied. Speech was natural and crisp, without edginess or other concerns. Music showed nice range and definition, and effects followed suit. Those elements appeared accurate and vivid. I didn’t think the track was active enough for a grade above a “B”, but I still felt it worked well for the material. For this “Hard Evidence Edition” of Primal Fear, we find a mix of extras. We open with an audio commentary from director Gregory Hoblit, writer Ann Biderman, producer Gary Lucchesi, executive producer Hawk Koch, and casting director Deborah Aquila. All five sit together for this running, screen-specific track. They examine cast and performances, sets and locations, visual design and cinematography, the script and the adaptation of the source novel, editing, and how the various participants came onto the project. While we learn a fair amount about the flick, the commentary tends to be rather up and down. It starts slowly, and it sputters occasionally as it progresses. Also, it suffers from an awful lot of praise for the various actors. We expect some of this since the cast includes so many actors who were then little known at best, but it still feels self-congratulatory. Still, we do get a lot of good facts, so despite the inconsistencies, the commentary deserves a listen. One correction: during the commentary, one participant claims that Fear musters a crummy 38 percent “fresh” rating on Rotten Tomatoes. That’s way off base. It’s actually at a good 68 percent, and that jumps to a very solid 80 percent when isolated to the “top critics”. I’m not sure why the filmmakers want to tell us that the movie was panned in its day, but it wasn’t; it earned good reviews all those years ago. Three featurettes follow. Primal Fear: The Final Verdict goes for 17 minutes, 59 seconds and features remarks from Hoblit, Lucchesi, Koch, Biderman, editor David Rosenbloom, and actors Edward Norton and Laura Linney. 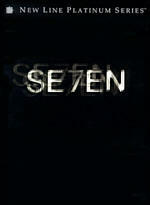 “Verdict” examines the source novel and its adaptation, cast and performances, deleted scenes, the film’s ending and its legacy. Perhaps inevitably, a lot of the content provided here already appears in the commentary. However, the new participants manage to add additional perspectives that add to the information. It’s especially good to see Norton and Linney. The redundant material makes this featurette less enthralling, but it includes some nice material. It’s too bad the DVD doesn’t include any of the deleted footage, though. Next comes the 17-minute and 56-second Primal Fear: Star Witness. It includes notes from Hoblit, Aquila, Norton, Lucchesi, and Koch. The program concentrates on casting the Aaron character. As with the prior featurette, much of “Witness” repeats from the commentary. Here Norton’s participation makes a big difference, though, as it’s fun to learn about the casting process from his perspective. I especially like his Sherry Lansing story; those elements make “Witness” worth a look. Finally, Psychology of Guilt goes for 13 minutes, 36 seconds and gives us comments from Justice Roger W. Boren, forensic psychiatrist Dr. Park Dietz, and forensic psychologist Dr. Dan Sussman. They discuss the insanity defense as well as issues related to multiple personalities. This becomes the most involving of the featurettes, as it provides a very interesting look at the way the law works with defendants with alleged psychological disorders. It’s a fine show. A few ads open the DVD. We get clips for Eagle Eye and The Godfather trilogy. These appear in the Previews area as well. The DVD also provides the theatrical trailer for Fear. Primal Fear launched Edward Norton’s career in a big way, and that fact remains its main claim to fame. Without Norton and the film’s excellent cast, Fear feels like little more than an ordinary legal potboiler. It entertains but it fails to become exceptional. The DVD provides mediocre visuals, good audio and a mix of interesting supplements. Fear deserves a look for Norton’s Oscar-nominated performance, but don’t expect a particularly stellar film.